Geocaching is an outdoor adventure game, similar to a treasure hunt played with a GPS capable device. The basic idea is to locate hidden containers called "caches", trade trinkets of equal or greater value along the way, then sign the logbook at each cache before sharing your experiences online. 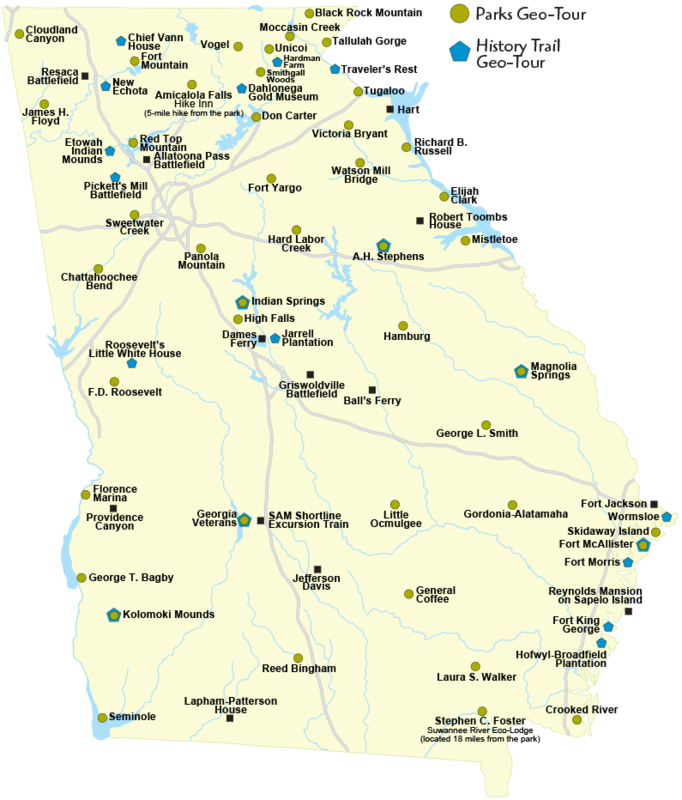 After obtaining coordinates and hints from www.geocaching.com, you can begin searching Georgia State Parks & Historic Sites locations for these hidden caches. Geocaching is the ideal activity for families or anyone looking to try a new outdoor activity. There are many geo-adventures awaiting in Georgia State Parks. More than 40 State Parks participate in the Parks GeoTour, and more than a dozen historic sites are on the History Trail GeoTour. The History Trail features indoor boxes with combination locks that can only be opened after learning about the site's history, solving clues and discovering the combination; it’s a new twist on some of Georgia’s oldest attractions! While searching for caches, please follow the Leave No Trace guidelines. We’ve hidden 47 caches in 44 state parks, taking you all around Georgia. The quest ranges from easy to tricky. (Hint: you might need a tide chart for one of the bonus caches.) Best of all, any age can participate and share the fun of treasure hunting. Note: A parking fee may be required for parks. Annual passes available. Create a free account at www.geocaching.com, click 'Play' and select 'GeoTours'. You will be given a hint and coordinates to start your treasure hunt. Download a GeoTour Park Passport and print it out. The grids will be used to record your success. When you locate a cache, you can trade a trinket of equal or greater value then log your name and any comments to the logbook. Find the stamp inside the cache and use it to mark the corresponding park location box on the grid of your GeoTour Park Passport. Find all the caches to reveal the message! Brag about your find online, but don't reveal the code to others as they will want to find it for themselves. Complete specific numbers of caches to be eligible for a custom geo-coin. Take a photo of your GeoTour Park Passport and email it (along with your name and address) to parksRfun@dnr.ga.gov. 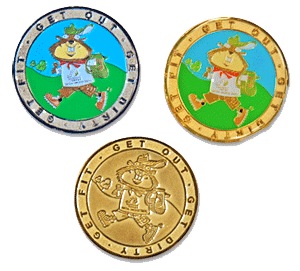 We will mail you your bronze, silver or gold level Park Geo-Coin! Sleuth across the Peach State as you visit 19 historic sites, solving clues along the way. Only by answering questions about Georgia’s history will you be able to open the combination lock to each geocache. This game can be played with the geocaching app or with a GPS device. Note: An entry fee may be required for historic sites. Historic site passes available. Go to the geocaching.com Georgia History Trail page, log-in and find GPS coordinates and clues. Download a GeoTour Time Travel Ticket and print it out. The grids will be used to record your success. Check our website for hours of operation and admission fees of each site. In this GeoTour most of the caches are mystery/puzzle geocaches. You'll need to visit 3-5 stages (locations) within the state historic site, the final location being a locked ammo can. Answer questions at each stage to determine the 4-digit lock combination for the final geocache. After you find the geocache and correctly open the combination lock, log your name and comments inside the geocache then trade a trinket of equal or greater value. Find the letter inside the cache and write it in the corresponding historic site location box on the grid of your GeoTour Time Travel Ticket. Find all the caches to reveal the message! Log back into www.geocaching.com to tell of your experience and brag about your find! Note: We are no longer doing trading cards and pathtag for the History Trail GeoTour but instead have a new trackable history geocoin to collect. Complete all History Trail caches to be eligible for a History Trail geocoin. 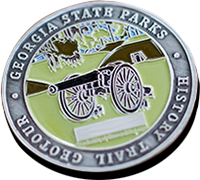 Take a photo of your GeoTour Time Travel Ticket and email it (along with your name and address) to parksRfun@dnr.ga.gov. We will mail you your own trackable History Trail Geo-Coin! We also offer orienteering, an activity which uses a compass and a map to navigate through the woods from one point to another at Cloudland Canyon, Panola Mountain, Red Top Mountain, Sweetwater Creek and Unicoi state parks, and a beginner compass course at New Echota State Historic Site.